Here is another blog post coming from the long NY Times article on our government's response to the threat of bioterrorism. This article is brilliant in its simplicity. It simply covers the field. The author interviewed over 100 people who work in biodefense, and he makes clear that the $60+ billion spent on bioterrorism efforts since 2001has not been well spent. To say the least. Excerpts and commentary follow. This refers to the fact that the USG has failed to pursue the most obvious way to protect Americans from bioterrorism: adding teeth to the treaty banning biological weapons. The 1972 treaty bans biological weapon production and use, but lacks any inspections or sanctions, making it almost imposible for the treaty to be enforced. ... After spending hundreds of millions of dollars, for example, to develop a new vaccine for anthrax that would replace the controversial formula developed 50 years ago by the Army — which is known to have serious side effects and has never been approved for children — there is still no new vaccine. The anthrax vaccine manufacturer is unique in the amount spent on lobbying, and is also unique in the 300% markup it receives for the vaccine over the cost of production. ... Last year, two separate review boards evaluated the state of the country’s biodefense program, and each report came back scathing. The National Biodefense Science Board, a nonpartisan task force created in 2006 to oversee countermeasure development, delivered a 103-page report to the secretary of Health and Human Services, Kathleen Sebelius, describing “lack of urgency,” “lack of coherence,” “lack of prioritization” and “lack of synchronization.” The title of the report was “Where Are the Countermeasures?” And the commission created by Congress in 2007 to evaluate all defenses for chemical, biological, radiological and nuclear threats delivered its final report, offering letter grades in several categories. For attention to the safe storage of toxins, the government received an A. For openness and transparency, a B-minus. For biodefense, the grade was an F.
"Emergent bought the Congress." You saw it in the NY Times. A poisonous vaccine, for which you can't get the CDC data or the military data on safety (data collected at taxpayer expense), has been stockpiled for the American public. At a total cost of about 2.5 billion dollars. The threat of bioterrorism has been used to justify enormous expenditures for a vaccine nobody wants to receive. The latest scam proposed to test the vaccine in children, to expand the vaccine indications. (Anthrax vaccine is not currently approved for those under 18 or over 65.) Both Republican and Democratic administrations have supported mandatory anthrax vaccinations. 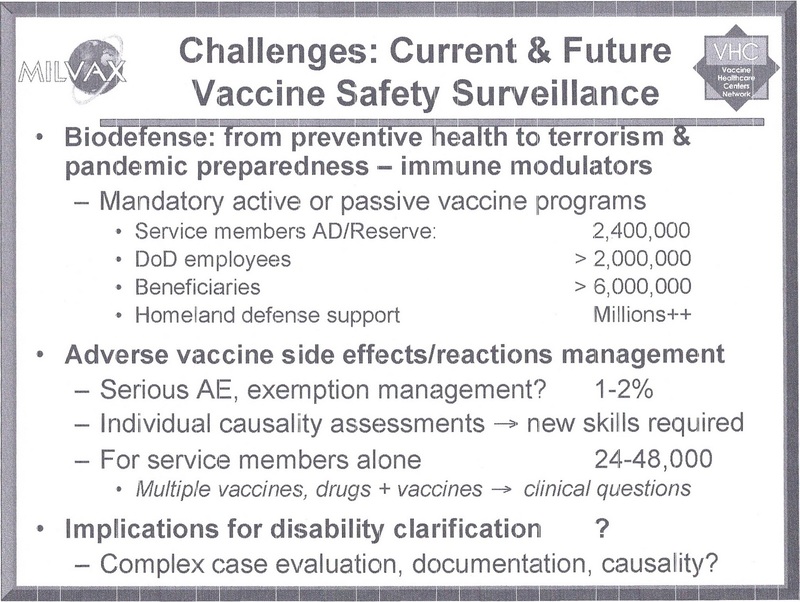 The last (Bush) administration approved the vaccine for civilian first responders. The Obama administration proposed testing the vaccine in children. Money seems to be one of those things that ignores party lines. According to a New York Times/CBS News poll in September, only 33 percent of registered voters believe their own member deserves to be re-elected, and a mere 6 percent said the same about most members of Congress, both the lowest figures since The Times started asking this question in the early 1990s. For starters, anthrax is not infectious. [What he is trying to say is that it is not contagious from person to person. It is, however, infectious, in that it does infect people and animals--Nass] This might come as a surprise to those who’ve only heard about this through the media. An anthrax “outbreak” is impossible, because the B. anthracis bacterium cannot spread from person to person. Vaccines against diseases such as measles, mumps, and influenza protect millions of people each year, because these are common infectious diseases that spread easily between people. Why did the most important trial to have been conducted on anthrax vaccine safety (by CDC between 2002 and 2007, with 1564 civilian subjects) only publish an interim report, and never discussed the 229 serious adverse events reported in trial participants? The trial tested serologic efficacy also. The investigators published partial data in JAMA on October 1, 2008, but only for the first 7 months of a 43 month trial, and only for 2/3 of the subjects. "Although groups initially considered for preexposure vaccination for bioterrorism preparedness included emergency first responders, federal responders, medical practitioners, and private citizens, vaccination of these groups is not recommended. Recommendations regarding preexposure vaccination should be based on a calculable risk assessment. At present, the target population for a bioterrorist release of B. anthracis cannot be predetermined, and the risk of exposure cannot be calculated. In addition, studies suggest an extremely low risk for exposure related to secondary aerosolization of previously settled B. anthracis spores (28,83). Because of these factors, preexposure vaccination for the above groups is not recommended. 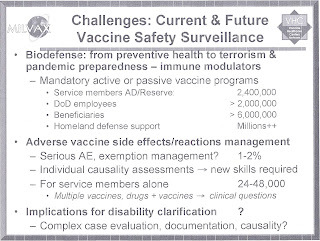 For the military and other select populations or for groups for which a calculable risk can be assessed, preexposure vaccination may be indicated." the decision to approve use of the vaccine in civilian first responders were all made without these data. All 3 decisions were made by DHHS agencies or their advisory committee, while a DHHS agency withheld the most important scientific evidence about vaccine safety and serologic efficacy. Is there any rational, scientific or ethical justification anyone can make for how DHHS can behave like this? How can anyone claim the Department of Health and Human Services is acting in the public good? The real question is who gave DHHS its marching orders, and what did they get in return? Congress ordered a civilian trial of anthrax vaccine in 1999, yet 12 years later we have thousands of injured people, but the CDC data on anthrax vaccine safety has not been shared with the public, though it was publicly funded. Do the data so challenge government policy that they have to be hidden? How could any policymaker, knowing this cache of data exists, not demand it before buying $1.25 B worth of vaccine, or proposing vaccine for first responders, and then children? The principal investigator of this trial for CDC is veterinarian Jennifer Wright. Jennifer briefed the ACIP (with significant omissions), leading to their vote in 2008 in favor of first responder vaccinations. Before Jennifer, veterinarian Nina Marano at CDC was in charge. It seems relevant that veterinarians supervised a human clinical trial; MDs have different ethical obligations than veterinarians. The following quote from the journal Nature is about the controversial early release last week of data from a malaria vaccine trial. It makes clear that the release of the very early CDC anthrax vaccine data was odd, and failure to publish the final data unacceptable, for a trial that ended 4 years ago. CDC would have us accept the cherry-picked preliminary data as the last word on this trial. We must demand the real thing. "Some researchers question whether the results should have been published before all the data were available; full results are expected in 2014. Interim trial data are usually reported only to regulatory authorities, and clinical trials published only once all the data are in, noted Nicholas White, a malaria expert at Mahidol University in Bangkok, in an editorial3 accompanying the interim results. "There does not seem to be a clear scientific reason why this trial has been reported with less than half the efficacy results available," he wrote." I decided to just say briefly what happened yesterday at the NBSB conference call. Every member of the NBSB, with the exception of Iowa's top public health officer, Patricia Quinlisk, MD, voted in favor of testing anthrax vaccine in children. Kudos to Dr. Quinlisk for making clear that her public health background precluded agreement. Panel member Ruth Berkelman suggested that a sentence be added to the recommendation, asking for a national ethics board to review the trial. Her suggestion was tweaked slightly and accepted by all. Were the panel members relieved to add another layer of review? the Secretary ...determines that the research presents a reasonable opportunity to understand, prevent, or alleviate a serious problem affecting children’s health or welfare, and, in addition, determines that the research will be conducted in accordance with sound ethical principles and that adequate provisions are made for soliciting the assent of children and permission of their parents or guardians as discussed in 46.408. Sound ethical principles, of course, means you have to tell the truth about what is known regarding safety and efficacy of this vaccine, and furthermore, tell parents that the HHS secretary has given anthrax vaccine a PREP Act waiver, and the manufacturer cannot be sued for damages. Reader comments appended to the online news articles about the meeting (Google says there are 289 articles) almost uniformly pan the vaccine trial. The most frequent comments have to do with whose children should be those tested first: those of panel members, DHHS officials, Congress or Obama. It seems everyone except the professionals understands this trial involves human sacrifice, regardless of media reports that the vaccine has been sufficiently tested in adults. In the end, Assistant DHHS Secretary Lurie told the panel that the department would decide whether to follow their advice, and when. "We're not ready to make a decision at this time but will continue the dialogue," Lurie said. To me she sounded lukewarm. For the first time, the issue of "finding the money for the trial" came up. Reading between the lines, I heard, 'this seemed like a good idea at the time, but with an election coming up, we don't need to antagonize yet another constituency.' If self-preservation is the strongest impulse of a bureaucrat, I don't see Lurie authorizing this trial in the next 12 months. Maybe never: if it bombs, she'll take the fall. On the other hand, there is a lot of money involved, with a new contract inked on October 3 by DHHS for an ADDITIONAL $1.25 BILLION anthrax vaccine for the civilian stockpile. Always follow the money. DHHS didn't ask where it was going to find the money for that in the federal budget. Do you think an anthrax vaccine should be tested on children? ... The nation's preparations for a biological strike face numerous challenges, according to more than 100 interviews with high-level officials at participating federal entities such the National Institutes of Health and the White House, as well as the the Health and Human Services, Defense and Homeland Security departments. Industry specialists have pointed to possible political motivations behind the 2006 cancellation of a deal for development of a new anthrax vaccine, shortly after the creation of a new Health and Human Services Department office intended to facilitate the creation of such treatments. In addition, the National Strategic Stockpile of medical countermeasures still lacks vaccinations for any potential biological "material threats" beyond anthrax and smallpox, and production of no such vaccine is slated to begin in the near future. Health and Human Services Secretary Kathleen Sebelius earlier this year said the countermeasure program was “full of leaks, choke points and dead ends." The 2001 anthrax mailings prompted an increase in biological defense funding from $633 million to $4 billion the following year, with a focus on adding to a medical countermeasure cache established in the late 1990s that comprised primarily of 15 million smallpox vaccinations as of mid-2001. The National Institutes of Health and numerous independent scientific groups in the United States pushed from 2001 until 2004 to refine new manufacturing procedures and expand the stockpile of vaccine for smallpox, a disease eradicated from nature that is known to spread readily and result in death for roughly every third person infected. The United States now holds in excess of 300 courses of smallpox countermeasures in the Strategic National Stockpile. Later that year , though, the Health and Human Services Department indicated it would terminate a deal with the biotechnology firm VaxGen for development of a new anthrax vaccine. Issue experts have continued to dispute what prompted the move. One target of blame has been Maryland-based Emergent BioSolutions, which produces the only anthrax vaccine now licensed by the Food and Drug Administration. Meanwhile, the BARDA office has only received small portions of its intended $1 billion yearly budget. The office has received additional funding since 2009, but some firms have described organizational complications created when Lurie asked contractors to coordinate with her rather than Robinson. Lurie and Robinson also provided diverging explanations for the agency's move way from vaccine development in favor of drugs that are potentially usable against multiple agents. Robinson, though, said the changing emphasis was motivated by the questionable medical feasibility of vaccines for additional agents. “There are only two biothreats -- smallpox and anthrax -- that we feel vaccination is the appropriate way to go,” the official said. “You can reassure people that there will be antibiotics available for them, and you can keep producing ever greater numbers of antibiotics. But you can see that if you had the ability to vaccinate people and protect them, it would provide a larger degree of protection. So to the extent that these things come to pass, I think there will be more pressure to develop vaccines,” Danzig said. Brett Giroir, a former head of the Defense Sciences Office at the Pentagon's Defense Advanced Research Projects Agency, also endorsed the development of vaccines for a wider range of threats. Fauci questioned the practicality of the "material-threat" list. “Do we have this little thing in the stockpile or not? I don’t judge the safety of the country on that basis. To me, the idea of a naturally occurring threat is infinitely greater,” he said. The official described the list as a remnant of Cold War-era planning for a biological strike by the Soviet Union. O'Toole said Fauci's remarks were "completely wrong" regarding the list. The absence of one person at the White House who would work solely on biological readiness matters is another concern, according to past and present officials. Currently, four top White House staffers have some level of involvement on the issue while also dealing with other matters, according to the Times (see GSN, Oct. 19). “The only way that you can get all of those people in the room is to call them into the White House, and to have a coordinating group under a single person,” said Kenneth Bernard, a health security specialist for the Clinton and Bush administrations. Randall Larsen, chief executive officer of the WMD Center, described a lack of a central coordination as a problem. “Today, there are more than two dozen Senate-confirmed individuals with some responsibility for biodefense. Not one person has it for a full-time job, and no one is in charge” (Wil Hylton, New York Times, Oct. 26). UPDATE: Judge to hear arguments on unsealing documents in this case. Though she said the working group was sensitive to ethical issues, she proposed that the group's recommendation be forwarded to an appropriate group for additional ethical consideration. The board tweaked its recommendation to include Berkelman's suggestion. John Grabenstein, RPh, PhD, senior medical director for adult vaccines at Merck, said he has served on ethics review boards for about 20 years. "Kids are recognized as a vulnerable population, and there are special requirements to protect them," he said. "I'd rather know what the response is before the vaccine is offered to many, may kids." The report's recommendations support the writing of a good protocol that would give parents a lot of information and plenty of time to consider all the aspects of a pre-event study, he added. In April Dr. Nicole Lurie, Assistant Secretary for Preparedness and Response (ASPR) at HHS, asked the NBSB's anthrax working group to explore complex scientific, ethical, legal, and regulatory issues related to pediatric anthrax vaccination. The group held a public engagement meeting in July, and in September presented the report's executive summary to the full board and fielded comments from the public. Anthrax vaccine adsorbed (AVA) has been used in about 2.5 million military members, so researchers are more familiar with the vaccine's safety and immunogenicity profiles in adults. Though US bioterror response plans say both adults and children should receive three doses of the vaccine with antibiotic prophylaxis after an anthrax attack, no studies have been conducted in children, which make up about a quarter of the US population. During the public comment part of the meeting, members of the public strongly opposed the NBSB's recommendation, while others spoke in favor of it. Vera Sharav, with the Alliance for Human Research Protection, told the group that there is no evidence that anthrax is a threat that affects US children, and she accused the board of making the decision to protect vaccine company profit margins. However, Steve Krug, MD, a pediatrician and emergency physician in Chicago, said he took part in the NBSB's public engagement session in July. "The ethical issues are very pertinent, but I support the recommendations of this working group," he said. The report and recommendation passed by a 12 to 1 vote. Patricia Quinlisk, MD, MPH, the board's chair, opposed sending the recommendation to HHS. "My background has influenced how I feel. I don't know if a pre-event option is the appropriate response," she said during the comment period before the vote. Quinlisk, a microbiologist and epidemiologist, is medical director for the Iowa Department of Public Health and has served on a host of vaccine safety and bioterror advisory groups. "We're not ready to make a decision at this time but will continue the dialogue," Lurie said. Other stories about this can be at the Washington Post, Science and Fox. The Scottish Government is recalling thousands of flu vaccines over fears that the drug is making some people ill, the Press and Journal can reveal. About 300,000 doses of Preflucel are being withdrawn immediately from surgeries and pharmacies across the UK and Europe. Health chiefs have warned that one of the most recent batches, issued at the beginning of September, is causing more side-effects – muscle pain, headaches and fatigue – than previous vaccines. They have been recalled while its manufacturer and the Medicines and Healthcare Products Regulatory Agency investigates what has gone wrong. Doctors and nurses in Scotland – where 2,500 vaccines have been recalled – have been told not to use any Preflucel until further notice. How critical is it to test drugs and vaccines in kids before giving them to kids? As of 2008, an estimated 50 to 60 percent of prescription drugs used to treat children have been studied in some part of the pediatric population. Still, the likelihood that a medicine has actually been studied in neonates—children less than a month old—is close to zero. In other words, we "guesstimate" pediatric doses most of the time. Guesstimating an anthrax vaccine dose, particularly since we have tested the vaccine in many small monkeys, would not be a stretch from standard pediatric practice. The Obama administration is wrestling with the thorny question of whether scientists should inject healthy children with the anthrax vaccine to see whether the shots would safely protect them against a bioterrorism attack. A key working group of federal advisers in September endorsed testing, sparking objections from those who consider that step unethical, unnecessary and dangerous. The National Biodefense Science Board (NBSB), which advises the federal government, is to meet Friday to vote on its working group’s recommendation. The vaccine has been tested extensively in adults and has been administered to more than 2.6 million people in the military. But the shots have never been tested on or given to children, leaving it uncertain how well the vaccine works in younger people and at what dose, and whether it is safe. Unlike with measles, mumps and other diseases, the chance that children will be exposed to anthrax is theoretical, making the risk-benefit calculus of testing a vaccine on them much more questionable. Anthrax is a life-threatening infection caused by a toxin-producing bacteria long considered a bioterrorist’s likely choice because it is relatively easy to produce and distribute over a large area. A week after the Sept. 11, 2001, attacks, letters containing anthrax spores arrived at several media offices and two Senate offices, killing five people and sickening 17 others. The FBI eventually concluded that the letters were mailed by Bruce Ivins, a disgruntled scientist at Fort Detrick in Maryland who committed suicide in 2008, although some experts question the FBI’s findings. As part of broad effort to better protect Americans against bioterrorism, the Pentagon began a controversial military anthrax immunization program in 1998 that was challenged in court over questions about the vaccine’s safety and reliability. Currently, the Pentagon requires the shots for personnel assigned to bioterrorism defense activities and some other special units, as well as those deployed 15 or more days in the Middle East and some nearby countries, and in South Korea. In April, Nicole Lurie, the assistant secretary in charge of bioterrorism at the Department of Health and Human Services, asked the 13-member biodefense board to evaluate whether the vaccine should be tested in children. A federal simulation of an anthrax attack on San Francisco, called Dark Zephyr, raised quesions about how to handle children. But testing drugs and vaccines in children is problematic. Parents generally are allowed to let their children participate in studies only if they would face minimal risk or would be likely to benefit directly or indirectly in some way. Some question the value of a study, saying that testing in animals indicates it will be difficult to determine what level of immune system response will be protective. UPDATE: Professor Les Baillie, who directed anthrax research at Porton Down, UK and also worked on biodefense for the US Navy, made exactly the same point in the November 2 New Scientist: "The proposal is to vaccinate children and measure their immune response, but no one knows what level of immunity will protect humans against infection. "What will these tests show?" Baillie asks." This is the real question: what could the trial actually glean of scientific value? The answer is: nothing. A child trial, without exposing children to anthrax, is only a cynical marketing ploy and nothing more. Potential conflicts of interest. J.S.B. 's employer has received research grants from Johnson & Johnson and Wyeth Pharmaceuticals and holds consultant contracts with Johnson & Johnson, Wyeth Pharmaceuticals, and Bayer Pharmaceuticals. If the board endorses the recommendation, Lurie will meet with counterparts at the FDA, the National Institutes of Health and other agencies to work out the details, including how many children would be studied, at what ages and doses, and how costs would be covered. A UPI story on this subject is here. AUSTRALIA'S drug regulator will demand an explanation from drug-maker CSL after it emerged the company knew two years ago about research suggesting a sharp rise in fevers linked to its seasonal flu vaccine, but omitted this from information given to doctors. As health authorities noticed a number of serious reactions to the vaccine early last year, the legally required product information sheets continued to rely on figures from 2005. These showed 22.5 per cent of children under three experienced a fever afterwards, dropping to 15.6 per cent among three- to nine-year-olds. The same study that produced the 2005 figures contained updated figures for 2006 that showed the rate of fever had nearly doubled, to 39.5 per cent for children aged six months to three years and to 27 per cent for older children. DARK specks floating in vials of swine flu vaccine posed no safety hazard, CSL has concluded after an investigation sought by the US Food and Drug Administration. ... Martin Friede, PhD, who heads the Technology Transfer Team within the Department on Innovation, Information, Evidence and Research at the World Health Organization in Geneva, Switzerland, spoke about influenza vaccine adjuvants. Adjuvants are added to vaccines to improve the immune response. They are known to increase antibody titers; reduce antigen dose (dose sparing for a pandemic); reduce the number of doses needed because they provide more rapid protection; enable immunization in patients with weakened immune systems; provide appropriate bias; and induce cell-mediated immunity, according to Friede. “They are a critical enabling component for subunit/recombinant vaccines,” he said. Friede said alum adjuvants are widely used in pediatric vaccines — including DTP, Hepatitis B virus and pneumococcal vaccines — because they enhance titers and they have a long record of safety. The drawback with alum adjuvants is that they are not really suitable for yearly administration because the adjuvant effect is dependent on many factors, according to Friede. He added that there are challenges that are specific for influenza, including that the antigens are variable and that the benefit for influenza vaccines is not convincing. “Each year, the influenza antigen with aluminum changes and it is very different to make it consistent,” Friede said. Despite its limitations, there are several influenza vaccines with alum — whole killed virion vaccines and split vaccines — that are approved for use around the world but not in the United States, according to Friede. Oil-in-water emulsions are simply droplets of oil in water (~100 nm), the most common of which are squalene & tocopherol and tween & lecithin. The MF59 adjuvant (Novartis) is made from squalene in water with Tween + Span and has been used in influenza vaccines in European countries since 1996. The push toward development of the MF59 adjuvant began with the last emergence of H5N1 because it required an enormously large dose of antigens needed to get an immune response. “However, the moment you add oil and water, the immune results were enhanced enormously,” Friede said. In 2009, when MF59 was incorporated into the 2009 H1N1 pandemic vaccine, it increased global vaccine production capacity to more than 200 million doses distributed for all ages. “I would say to stay tuned because you may have an influenza vaccine with this adjuvant available in your country soon,” Fried said. BRUCE E. IVINS has been dead for three years, but questions still abound about whether he carried out the 2001 anthrax attacks that killed five people and seriously sickened 17 others. The FBI compiled what appeared to be an overwhelming case against the former microbiologist at Maryland’s Fort Detrick. In the weeks before anthrax-laced letters were mailed, FBI affidavits claimed, Mr. Ivins stayed late nights and weekends at the Army lab that allowed him to work undetected while cultivating the deadly spores. And the FBI provided a possible motive: An anthrax vaccine program Mr. Ivins was working on had run into trouble; an attack could give the project a boost. But the coup de grace, according to the bureau, was provided by a cutting-edge genetic test of the anthrax spores that linked Mr. Ivins to the attack. Mr. Ivins took his own life in 2008 just as the Justice Department was preparing to charge him. This scientific evidence came under fire in February when the National Academy of Sciences, which was commissioned by the FBI to review the case, reported that the bureau had not performed enough tests or been precise enough to conclude definitively that Mr. Ivins was the lone culprit. Now three independent scientists have teamed up to publish a paper in the Journal of Bioterrorism and Biodefense that points to other alleged failings in the FBI’s testing procedures. Also this month, a joint investigation by PBS’s “Frontline” newsmagazine, the ProPublica online newsroom and McClatchy Newspapers raised additional questions about the accuracy of the FBI investigation. For example, the journalists revealed that Mr. Ivins handed over to investigators lab flasks that contained telltale markers found in the anthrax used in the attacks. This revelation appears to contradict FBI assertions that Mr. Ivins withheld or manipulated evidence. Doubts about the investigation were bound to linger since Mr. Ivins killed himself before he could be tried. But the uncertainty is unacceptable. Congress should convene a panel of independent law enforcement specialists and scientists to pore over the evidence collected in the course of the FBI investigation — including classified information that was withheld from the NAS panel. Such an inquiry should attempt to get to the bottom of the 2001 attacks and assess the nation’s ability to prevent a similar attack. If someone tried to kill Americans with Bacillus anthracis spores today, the nation would have a better medical tool chest for treating the sick and those potentially exposed than it had 10 years ago, when the anthrax letter attacks killed five people, but anthrax defenses are still a work in progress. The government has enough doses of antibiotics in its civilian stockpile to treat 60 million people for the recommended 60 days... US Department of Health and Human Services (HHS) officials won't disclose the amounts of materials in the Strategic National Stockpile (SNS), citing national security concerns. The SNS also contains enough doses of anthrax vaccine—the same one that was in use in 2001—to protect a few million people... Meanwhile, several companies are working on second-generation vaccines with the aim of providing protection with fewer doses at less cost, but their availability is still several years away. Great. So we are "ready" for anthrax. Except, if we are well prepared for anthrax, any serious enemy would pick some other microorganism. Smallpox, anyone? Plague? Tularemia? Ebola? How about a newly synthesized bug? If the US government really wanted to protect us, instead of wasting our childrens' tax dollars on pet pork, it would not have walked out of negotiations to strengthen the Biological Weapons Convention. It would have cooperated with nearly the entire world to enact provisions in this treaty for verification of compliance, including inspections and sanctions. But this logical and relatively cheap approach to reducing the threat from state actors has been unpopular in US government circles. OTOH, can we afford to keep spending $60 billion every few years for a piecemeal, very limited response to the BW threat? Our current approach offers no meaningful protection against an apparition that, given the technology, can take millions of forms.